We now specialise in all Bathroom services. From the complete removal of your existing bathroom to a full design service, we can do it all. Tiling, no problem, helping chose the suite - we have many ideas to offer and we can even sort out all the electrics, let alone the plumbing! Give us a call to arrange a FREE Quotation. Although we are based in Saffron Walden, we often work in and around Great Dunmow. However, we cover a wide geographical area within Essex, Hertfordshire and South Cambridgeshire. For example we regularly visit customers in Braintree, Witham, Chelmsford, Harlow, Epping, Bishops Stortford, Ware, Cambridge and Haverhill. 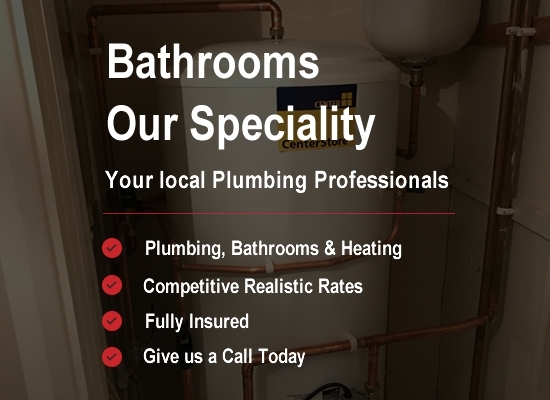 Based in Saffron Walden, N. Monk Plumbing and Heating have years of experience, we have been established since 1985. We cater for all areas of plumbing, gas and oil central heating, servicing and also specialise in bathroom design, tiling and installations and offer very competitive rates on all our work. From a complete bathroom replacement to a new boiler installation, we are always here to answer your call. We pride ourselves in the high level of customer service that we offer. If you want a reliable plumbing engineer, you can ring, email or complete the enquiry form on our contact page and we will get back to you. We can also arrange a FREE no obligation quotation. What you can expect from us. We can arrange convenient appointment times and work around your schedule. We pride ourselves with our customer service and guarantee all workmanship. We are fully insured with public liability insurance. We strive to give our customers piece of mind. We are known as the 'Friendly Plumbers'!